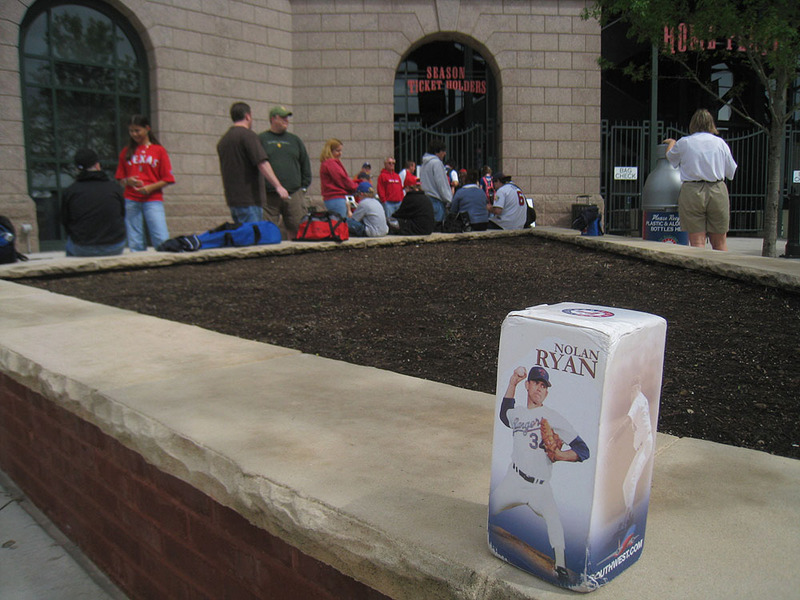 …and gave it to one of the season ticket holders. In exchange, he brought me into the stadium as his guest when the special “season ticket holders” entrance opened two and a half hours early. I was pumped! The rain had held off. I was gonna have a huge head start on the competition. Double digits would finally be mine. I could FEEL it. 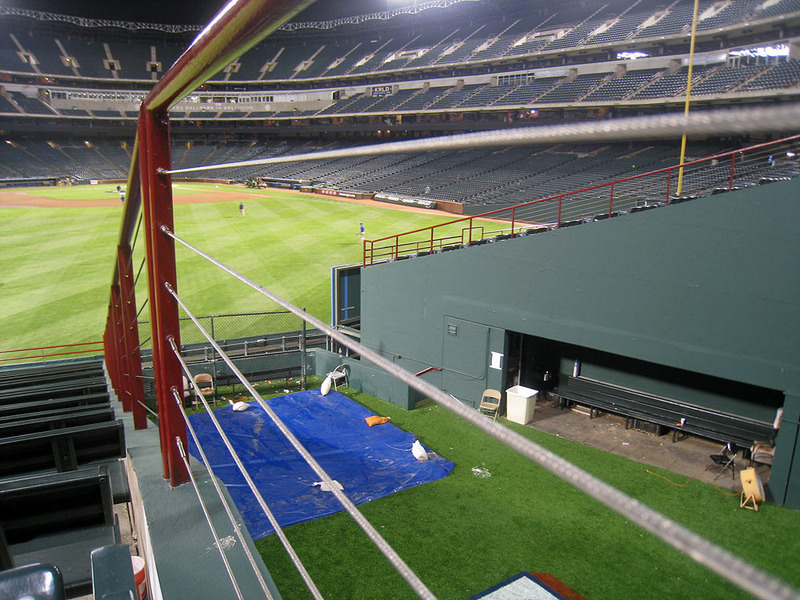 The cage was set up for batting practice, but the Rangers weren’t hitting. I don’t think I need to describe how frustrating that was. That ticket had gotten soaked on May 2nd, but you can hardly tell, right? (Note the price.) Can you identify this autograph? The pitchers had already begun playing catch at this point, and when they finished several minutes later, I got Eddie Guardado to toss me a ball near the foul pole where the wall slants up really high. …but in fact they were just stretching. …and it ended 25 minutes early! It was a snagging nightmare. The seats were crowded. There were kids everywhere. The White Sox weren’t hitting or throwing much into the stands. And I had to deal with a real jerk. There was a guy (who was about the same age and size as me) who thought it would be a good idea to block/grab me as I tried to run past him up the steps to get in position for a long home run. But that’s not all. When I told him to get his ******* hands off me, he accused me of running into him. It was one of the worst BP’s of my life. I only managed to get one ball. Gavin Floyd tossed it to me in left-center field. Meh. 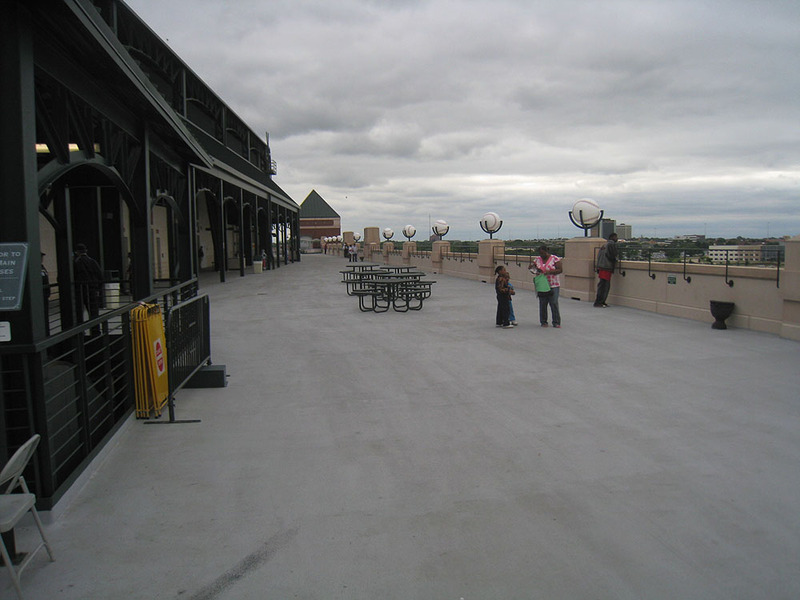 That was the one spot that had a decent amount of action, so I was tempted to head over there and claim a spot along the side railing. What kept me from doing that, however, was the fact that I would’ve been twice as old as everyone else. There wasn’t an official “kids only” rule, but that’s how it felt. Also, I noticed that whenever a ball landed there, the kids would dive and slip and pile on top of each other. It was an injury (and a grass stain) waiting to happen. I didn’t want any part of it. Once again…outstanding design. 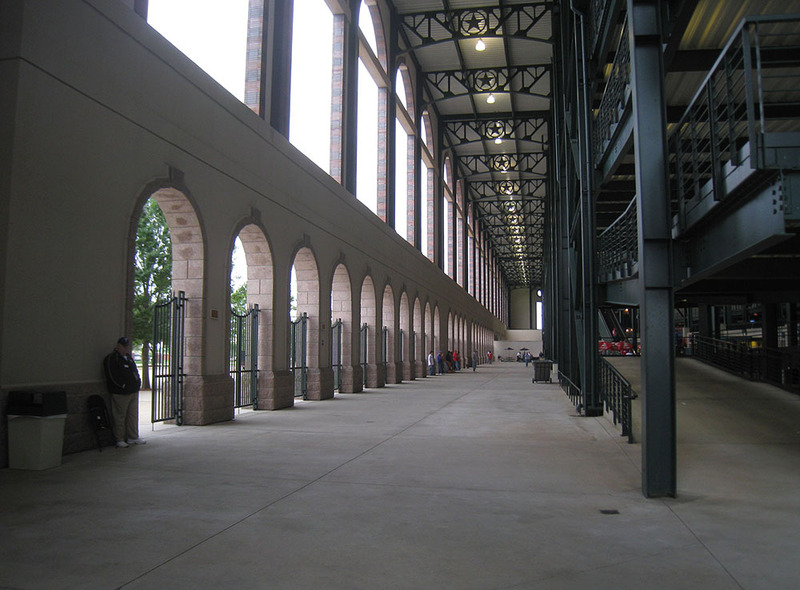 Why doesn’t every stadium have a concourse this wide? If you’re going to try to cram roughly 50,000 people into one building, especially in Texas where people tend to be rather large, you might as well give them room to walk around. This surprised me because the stadium is only 15 years old, and really, how hard can it be to fix something like that? Get a little concrete mix. (Or some gray Play-Doh.) 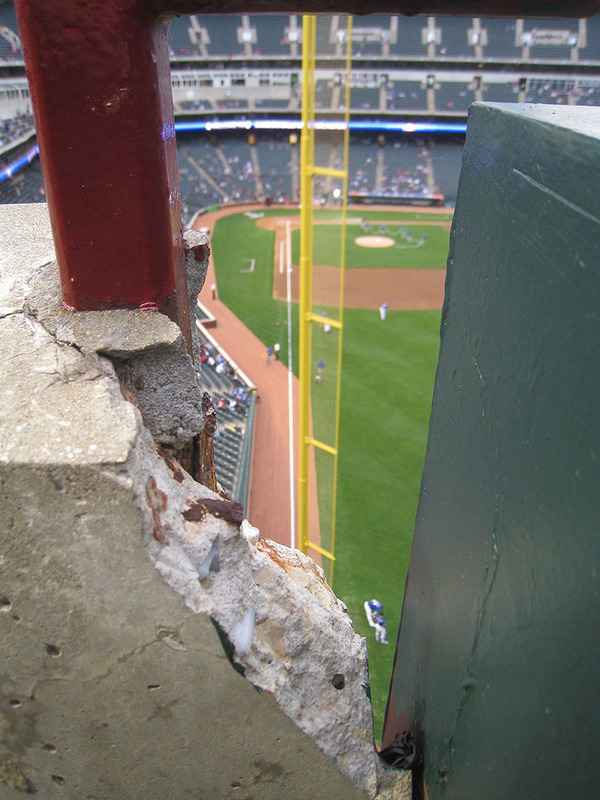 I’m pretty sure the upper deck didn’t start falling apart last month, so the question is: why wasn’t it fixed during the off-season? It’s like the Great Hall at the new Yankee Stadium–minus the ego. When the players finished throwing, I got Jayson Nix to toss me the ball. That was No. 3 on the day for me–still lousy but at least respectable, given the circumstances. 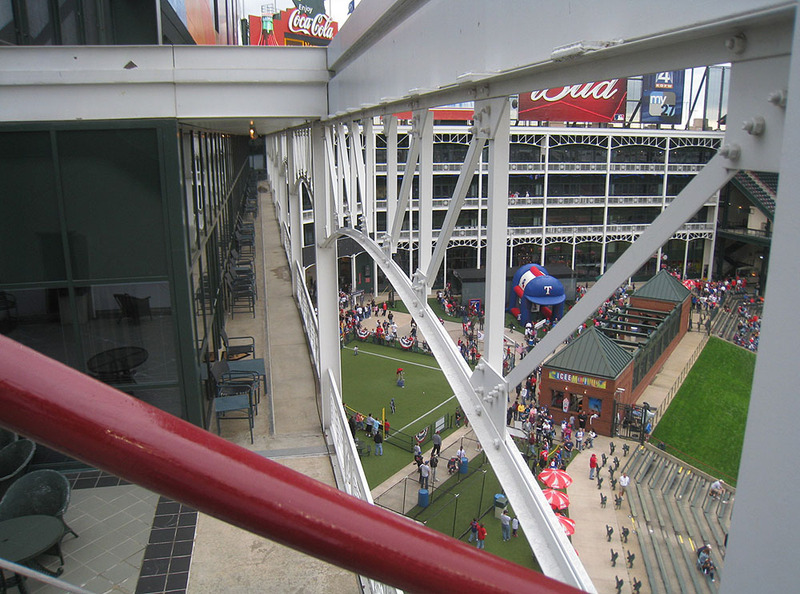 Okay, so it happens to be incredibly easy to catch a foul ball at Rangers Ballpark (there’s a great cross-aisle in the second deck, just in front of the press box…just like Miller Park), but so what? This type of fraudulent marketing is not only uncalled for, but it’s downright insulting to ballhawks across North America. I think we should all boycott Taco Bueno. It happened in the bottom of the 8th inning (and thanks, BTW, to everyone who sent me screen shots). 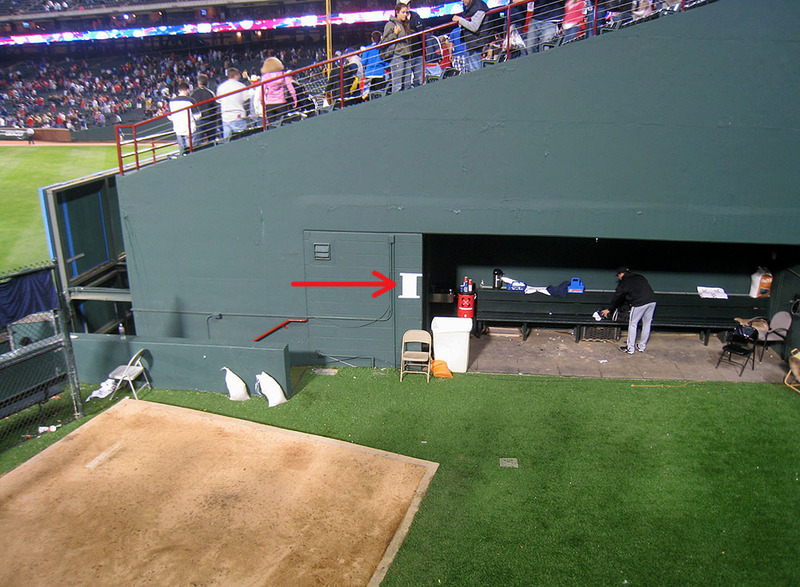 Nelson Cruz launched a deep fly ball in my direction, so I got up, scooted down the steps, weaved around a couple fans (without running into them, thank you), and made it to the corner spot at the bottom just as the ball was approaching. I knew it was going to fall short. I knew I didn’t have a chance. Certain camera angles might have made it look like I missed it by six inches, but in fact it was at least four feet away from my outstretched glove. The only reason why I even bothered reaching for it is that I figured I was on TV, and I wanted to look more like a participant than a spectator. But yeah…no chance in the world to catch it. If the ball had been hit a few feet father, I would’ve caught it on the fly, and if it had just gone a few inches father, it probably would’ve landed in the gap and I would’ve been able to retrieve it with my glove trick. But instead, the ball hit the very top edge of the outfield wall and bounced back onto the field. An inning before the near miss, I got my fourth ball of the day from White Sox center fielder Brent Lillibridge (not to be confused with Derek Lilliquist). It was his between-inning warm-up ball. I didn’t expect a visiting team’s player to toss one into the crowd, but when he looked up toward my section, I suspected that he was gonna let it fly, so I ran down to the front row and waved my arms. I quickly looked around to see if there were any White Sox fans. Maybe he was planning to aim for someone specific? Nope…just a sea of Rangers gear…so when he tossed it a bit over my head and five feet to my right, I didn’t feel guilty about moving back to the second row and making a controlled lunge for it at the last second. Other people had reached for it too. It WAS just intended for the crowd in general, so I went for it and made the catch. “Give it to the kid!” yelled someone in the third row. “Yeah! Give it to the kid!” yelled another fan sitting nearby. What kid? The kid who wasn’t wearing a glove and hadn’t even stood up to make an attempt to catch the ball? The kid’s face LIT UP, and his jaw dropped in such an exaggerated way that he could’ve been a cartoon character. “What do you say?” prompted his father. “Thank you,” mumbled the kid without taking his eyes off the ball. Turns out it was the first ball he’d ever gotten, so I pointed out a few things about the logo and explained the “practice” stamp on the sweet spot. That was definitely one of the highlights of my day. The game itself was fine. Nothing special. The Rangers won, 5-1, and as soon as the final out was recorded, I threw on my White Sox cap and rushed over to the bullpen and got coach Juan Nieves to throw me a ball. But he missed. Of course. He flung it carelessly and it sailed ten feet to my left. Thankfully he had another ball and was nice enough to under-hand it right to me. I started to ask the guy for it, but he hurried out of the bullpen before I had a chance to finish my request. There were still a few fans milling about. Three groundskeepers entered the bullpen and began working on the mound. I walked down to the front row and asked them if they could give me the lineup card. They ignored me. An old usher walked over and told me it was time to leave. I explained why I was still there, so he encouraged me to ask them again, but insisted (very politely) that I’d have to leave after that. “Excuse me, guys–” I began. “Can’t do it,” one of them snapped without looking up. I couldn’t believe that I was allowed to just sit there, but this wasn’t New York, so anything was possible. …and five minutes after that, a few other groundskeepers exited the bullpen in right-center and started walking along the warning track toward my side of the field. This was my chance! I waited at the back of the section until they got closer, then rushed down the steps and caught their attention at the bottom. They looked at each other like I was crazy, then flagged down another groundskeeper (who must’ve been their boss) and explained what I wanted and asked if it was okay. “I don’t give two *****,” said the guy who then walked briskly into the bullpen, headed over to the lineup card, yanked it off the wall (which made me cringe, but thankfully it didn’t tear), and handed it to me. 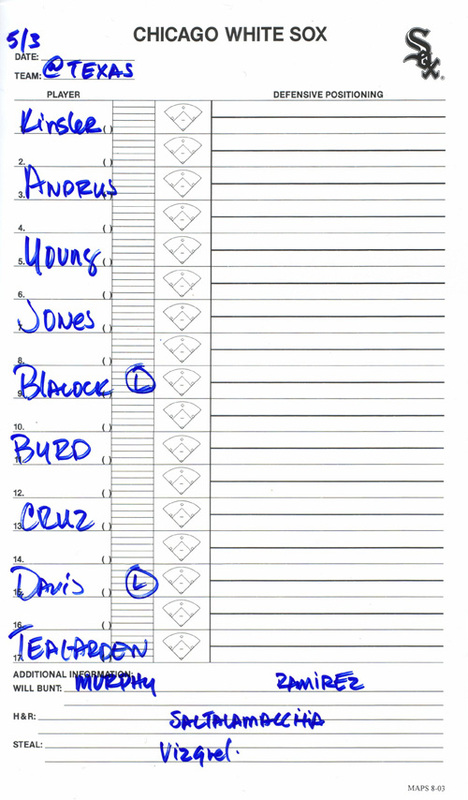 It was barely filled out, but that’s to be expected from a bullpen lineup card. All that mattered was that it was official. It had a nice big “Sox” logo on the upper right. 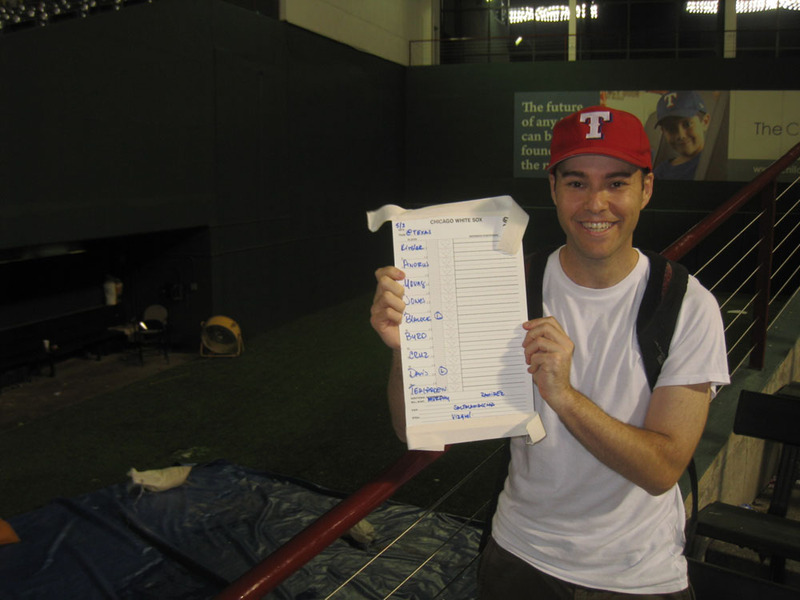 It had “5/3 @ Texas” written on the upper left in blue marker, and the Rangers’ lineup had been written in as well, along with a few bench players’ names at the bottom. So yes, even though I lost more than an hour of batting practice, and even though I had a frustrating near miss during the game, it ended up being a great day. I can’t wait to go back to this ballpark. Hugs and kisses to Texas. • 128 balls in 17 games this season = 7.5 balls per game. Carlos Quentin actually did throw me a ball last year and when he saw two kids with “In Quentin we trust” sign, he had the bucket boy toss him 2 balls and he walked clear across the outfield to give them the balls, autograph them, and talk to the fans for awhile. So, he isn’t always a jerk. 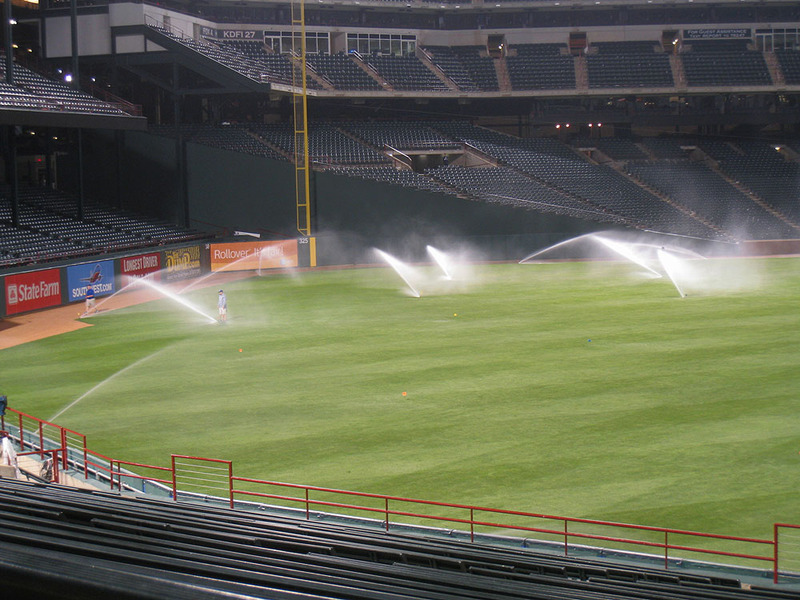 Rangers stadium looks like quite the park. I may never get there since I don’t really like to fly, but it was nice to see the place via your entries. I figured out what this park has Zack. This park has the charm of a minor league park while still managing to hold a major league game. Everything is lacks, it’s all about fun, and there are kids everywhere it seems. 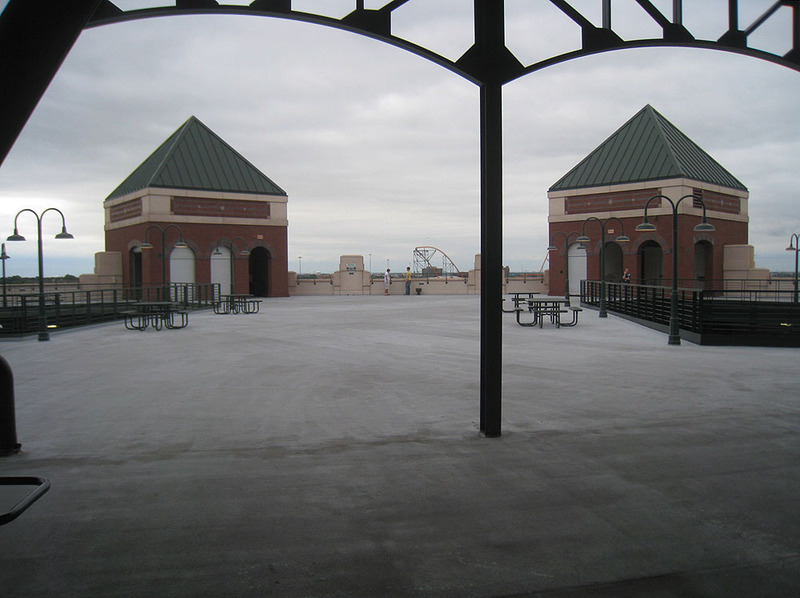 Nothing flashy, just a simple, down-to-the-basics ballpark. Apart from that, great entry. When I saw the ball going back to center field on ESPN, I knew I was gonna see a guy in a striped red/white shirt. 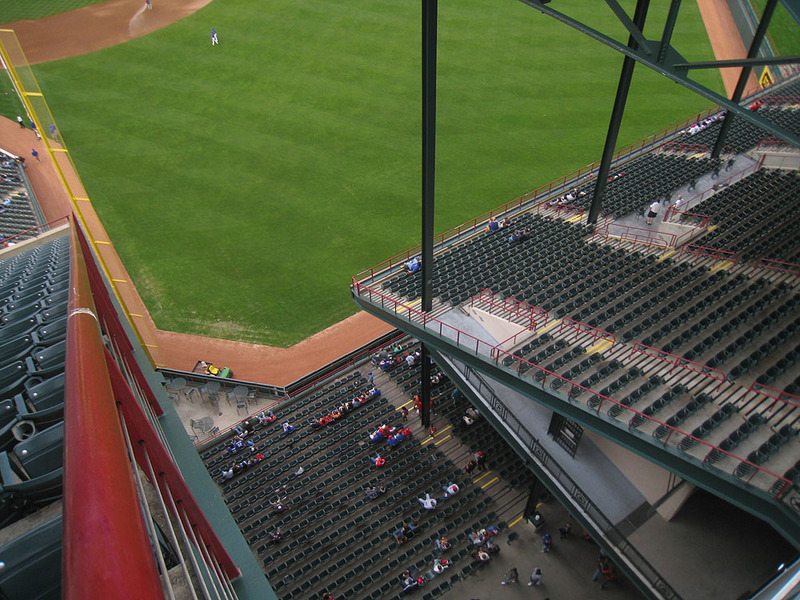 I was hoping to see a guy in a striped red/white shirt scrambling across the batter’s eye, but hopefully next time. That was a great entry. I loved the pics and NO RAIN. Finally, huh. I had two near misses on home runs tonight myself. I was about a step too late on Scott Hairston’s HR to pick it up off the ground and Chris Iannetta’s grand slam went right over my head. I was lined up perfectly, but it was too deep. A guy above us in the front row caught it. Rats! I did have a good day in BP though. The Rockies were hitting out 2008 All Star Balls, 2008 Washington Nationals Inaugural balls and regular balls. I got six total balls. 2 All Star, 2 Washington and 2 regular. That’s a great day for me, trust me. Those were my first 08 AS balls and first Washington ones too. Nice additions to the collection. I gave one of the regular balls to a disabled young adult in a wheelchair. Big smiles all around. He didn’t really understand about the ball though and he threw it at me at close range kind of hard. Thank goodness I was looking! I gave it back to him and he then threw it at another kid. His mom had to take the ball away from him. Ha ha. He looked like he was having fun. He just wanted to play catch. It felt kind of good to give that kid a ball. Also, today is my birthday. Woo hoo. My mother in law and I share the same birthday so we always have a big family dinner outing/party with the family. There is a game again tomorrow, but I also have the dinner party. Hmmm? Solution? I think I’m just going to BP to snag some balls, then rush home and change for the dinner. Ha ha. Wish me luck. Thanks for the heads up about the good times to be had in Arlington. Great posts. Oh yeah…. TC had a GREAT catch on a Todd Helton BP homer today. A thing of beauty. Sorry about jetting before the game started, I had to get back home unexpectedly. Good to meet you, sorry about the weak BP, it’s sometimes a goldmine. Glad you got the lineup card. Happy snagging! P.S. — As for the autographs, Hank Blalock & Taylor Teagarden. Excellent writeup. Man I cannot wait to get down to Arlington….God Bless Texas…. Nice road trip. If you had more luck down there, we’d be going for #4,000 in Baltimore together. Maybe now I’ll have to talk Felix Pie into dumping a whole bucket into your bag on Thursday night…. 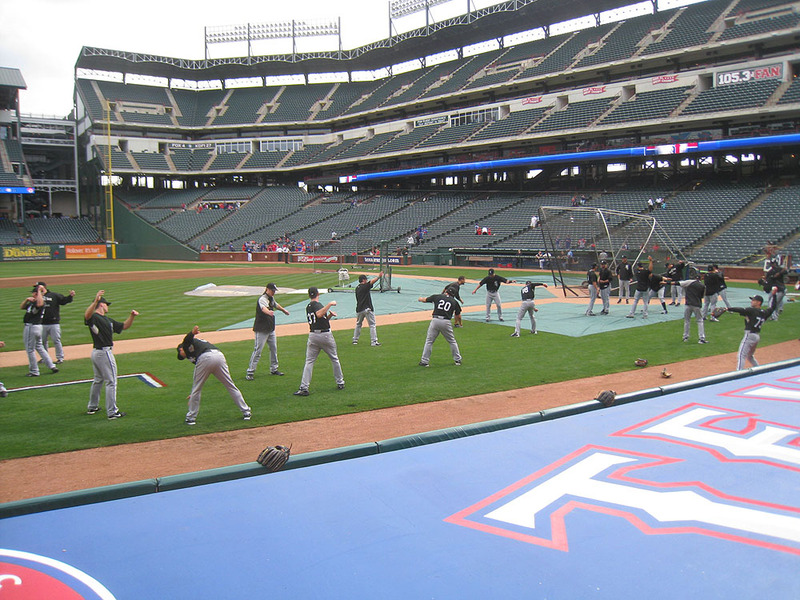 Texas is a pretty cool ballpark. Of course the only time I was there was when Sosa was going for #600 so it was crowded both days I was there. Anyway, the big reason for my comment is the TACO BUENO comment. Did you go to Taco Bueno?? It is one of the best taco places EVER!!! To most it could be better than catching a foul ball, just not us obsessive geeks! ZACK does LA less than 2 weeks away!! Totally awesome Texas trip and another great read, I bet it felt good to be left alone in the stadium without being told where you can go, where to you can stand, where you can sit, where you can eat, ok I think you get the picture. 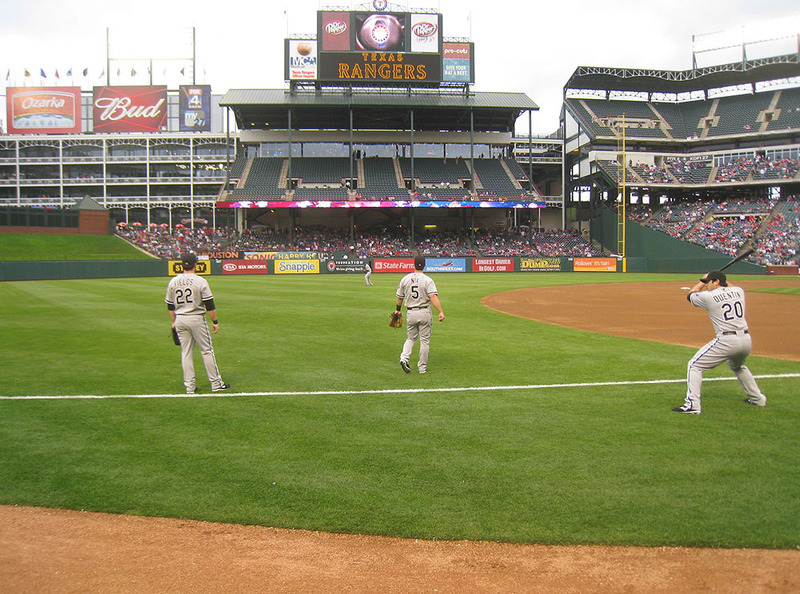 The Rangers Ballpark has always looked a great stadium to visit when I see it on TV, it’s on my wish list along with AT&T Park!! Zack, great recap! 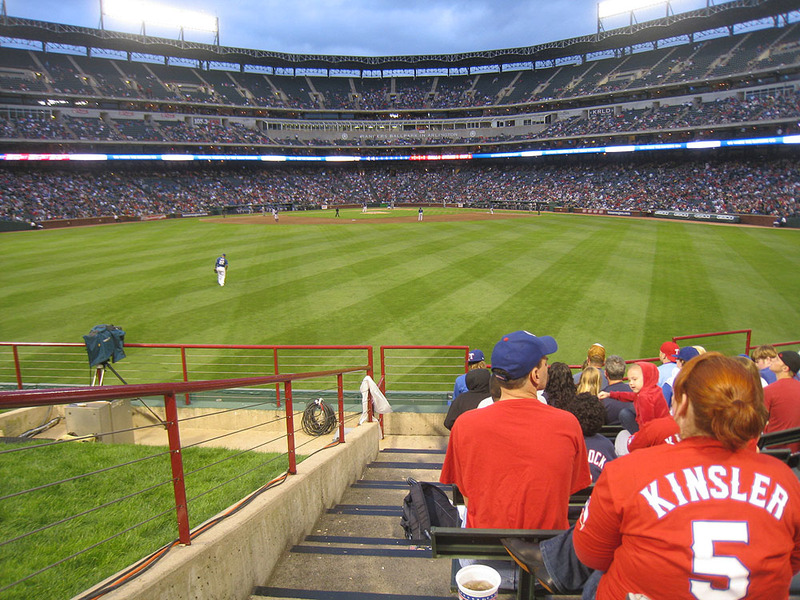 I need to get out to a Rangers game sometime! Hear about this? People were turned away from last night’s Red Sox-Yanks game because they were told there was zero chance of the game being played, and then at 9:20 they announced the game was back on, and they wouldn’t let the people re-enter. Unbelievable! I hate the Yankees and their stadium with a passion! Can you give W a little bit of credit today? 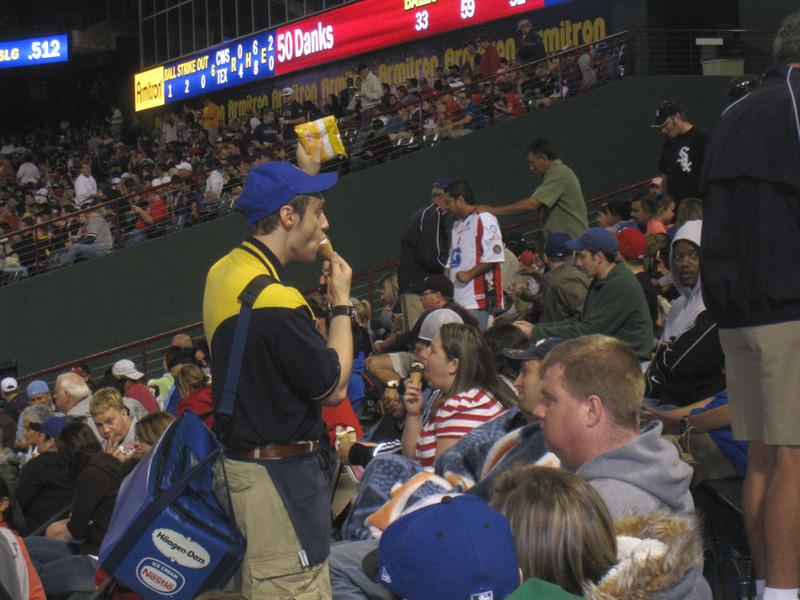 I think my favorite part of your blog is all the pictures in places not ordinarily seen in stadiums. Unfortunately, many of my trips to stadiums occurred prior to the time I had a digital camera and as a result I have about 36 pictures from each trip instead of 500–and of the 36, you can only hope they came out decent enough once developed. As a result, my pre-digital stadium memories are far more limited–and not just because of the passage of more time. Btw, that roller coaster is the Titan and on my lone trip to the Ballpark (evidently at the time A-Rod was alleged to be tipping and receiving tips on pitches), I spent the day before the game trying to ride every coaster at Six Flags. One last reason to like the Ballpark–at least when I went was the restaurant in LF overlooking the field. I experienced a rain delay and had a nice 90 to 2 hour dinner with my friend at a table at the window. But what made things most incredible was that the beer cost less in the restaurant than it did at the concession stands! I was told this was because there restaurant was an entirely separate entity and could price at it desired–but I doubt I would get that discount at Yankee Stadium. 5 balls is good for a Sunday game, and congrats on the lineup card. That’s too bad that ball didn’t land in the gap. I’m sure the cameras would’ve taken interest in the glove trick. The restaurant used to be Friday’s Front Row Grill, but it’s been gone for about 3-4 years. Then it was Rawling’s All-American Grill until the end of last season, & now it’s gone. 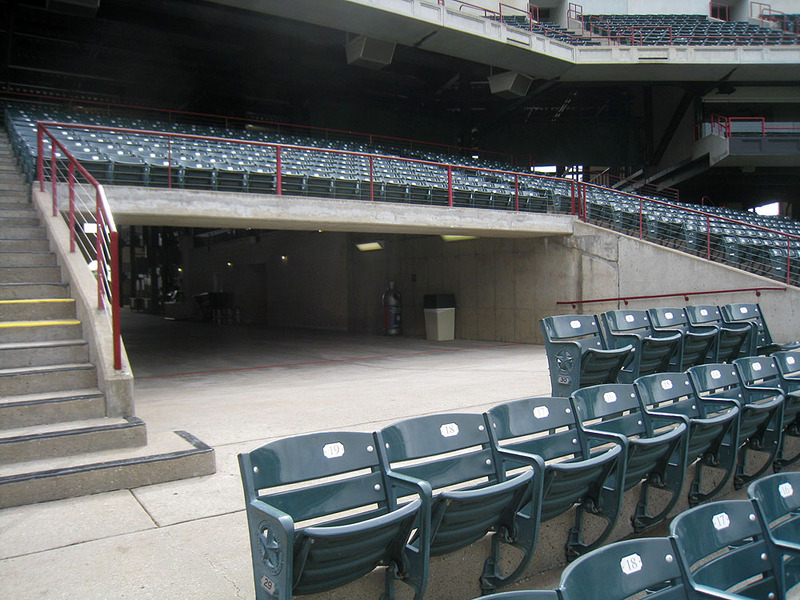 Now, this year, it is for the all-you-can-eat-seats, because they moved those sections to the upper porch in LF. 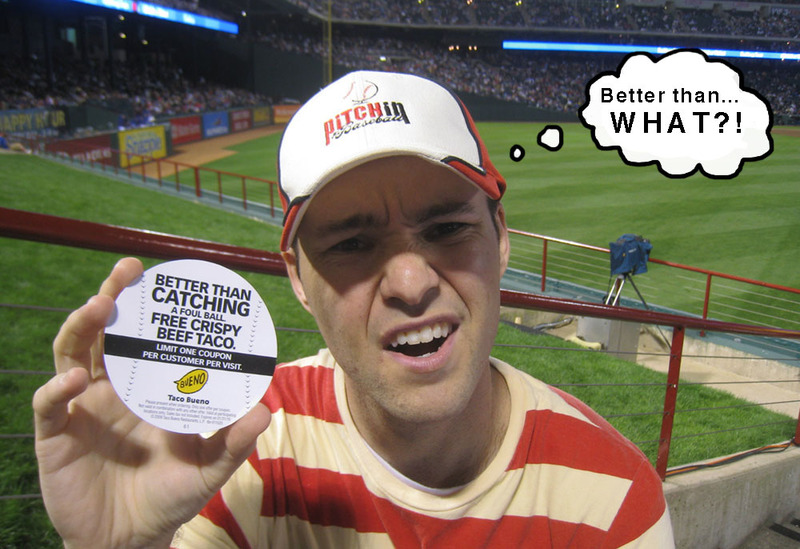 All you eat chicken sandwiches, nachos, peanuts, hot dogs, & drinks for $34 & on non-premier Fridays they’re $25. howdy pardner-did you find HANKS HOMIES in arlington?they have a cool blog,blalocks bro s and hanks honies ..Thanx for the thingofbeauty PADRELEIGH, i just ran and looked up and it was right in front of my face the helton bp hr was a nat comm ball.The rox are always the best for bp ,.i have to miss the sf- pods game 5/21 jimmy buffett is here in so cal.will the streak end?every pods game since 1984 to 2009?………..adrian gonz is stuck on 99 homers asa a padre,trade bait?sea tix for rest of year?…..thats bizarre yankees wouldnt let fans in after rain delay..
Sweet Zack! That’s the best panorama you’ve made so far! May 5, 2009 - 6:01 pm . Texas seems pretty enjoyable fine sir. Your slick ways to retrieve that lineup card was very professional as well. Because of the rain ruining the tea party, apparently we will all be meeting up on Thursday at Camden Yards, not Wednesday. Sorry for the confusion brotha man. See you then, again. The 8th is Watch With Zack, not the 7th, right? May 5, 2009 - 6:03 pm . Good to know about Quentin. What’s wrong with flying? It’s fun! Wheeeeeee!!! Yes, you nailed it with the minor league comparison. Awesome haul with all the commemoratives. That’s what I like to hear. Ahh, no worries. I was just glad to catch a glimpse of you. Hope we can snag together again soon. You are too kind. But really…stop being spoiled and start appreciating what you got. I’m soooo envious of you for being able to go to that stadium whenever you want. You got Blalock right, but the second one isn’t Teagarden. Hopefully I can get a few more of those Twins commemorative balls the next few days in Baltimore. Yeah, seriously. I had considered that. I needed to average 13 balls per game in Texas and Baltimore, and then I would’ve had it. Can’t wait to see you. No, I didn’t make it to Taco Bueno. I gave my coupon to Frank. You are correct about Francisco. Nicely done. Terrible indeed. It felt so unbelievably good. And now it’s back to reality. A Manny homer would be incredible. Yes, I’m totally ready. Just bought my tickets today. TEN tickets. I’ll be there with my whole family. Please don’t mention the Yankees again or I might throw up. Yes yes, okay, fine, I give the man credit. The rain-delay dinner overlooking the field sounds great. Yeah, but I’m not sure if the cameras would’ve seen anything more than my leaning over and dangling some string. No Homies. I heard they’re not around anymore. No worries. Gary already filled me in on your plans. Thursday it is…and the WWZ game is on May 8th at Citi. Hey zack its darron from st louis, i like the pitch in for baseball idea and hope it makes a lot of money. I have been to about 12 games and havent got a ball but i am starting to get better seats by getting to know the ushers.Last night i almost got hit with a foul ball but i was taking pictures instead of trying to catch a ball .it went about three feet above my head. My friend told me watch out and i was like the ball is already past but thanx for the warning : ). Then when ankiel hurt himself i went back to my seats to see what i could see from there becuase there was a fight on the third base side between a cards fan and a phillies fan. couldnt see much but ankiels fine so yea. This ballpark wouldn’t be as much fun to go to in August, I’m sure, but wow man, sounds like you had a blast, and as usual, great photos. It’s a very photogenic stadium. Very, very underrated. I’m kinda over the whole brick facade/kelly-green seating, but it works for this part very well. Yesterday was m,y birthday. back to back birthdays. I was at nationals park for my birthday, and i know that you know about my moms friend on the astros. well he hooked me up! i got a miguel tejada bat, a pair of michael bourn batting gloves and two right handed hunter pence batting gloves (both righty cause he only wears one batting glove). It was crazy! and it was cold, rainy and both teams playing arent too good, so the attendance was literally, under 1,000 people at the first pitch, and about 500 at the games end. it was ridiculous. i took a video of the game going on, then a full 360 view of the seats with about 10 people behind the dugout. all during the game. it was SO empty. amazingly empty. i’ll send you the video. Great job Zack. 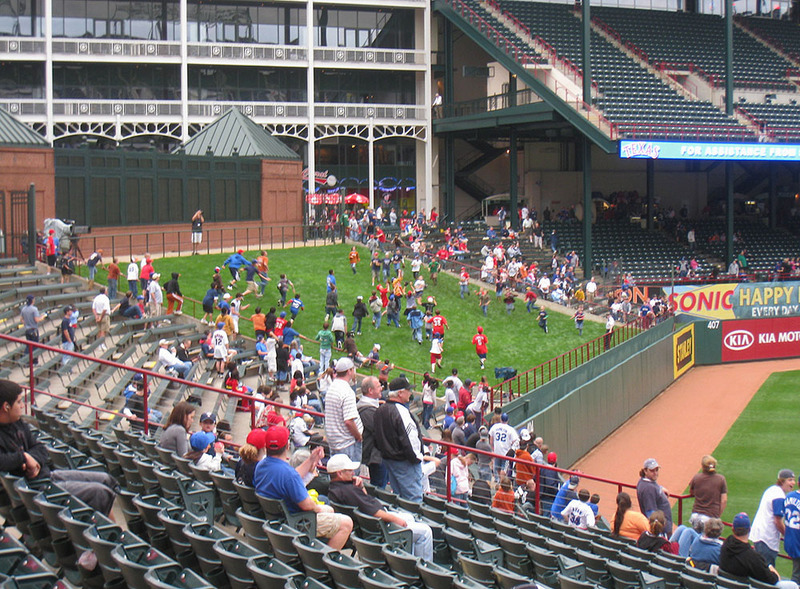 Texas looks like a great park for snagging. Have you ever snagged at Tropicana Field? If so, can you give any tips? The ushers there are really aggressive and won’t even let you stand in the 1st row during BP.. its very lame. Awesome that you were in Texas. Sounds like fun. Arlington park looks nice. Did you know that you’re on the cover page of MLBlogs?? It’s awesome! Check it out. Awesome entry, that place looks so sweet. Nice due-diligence in getting the lineup card, that’s SICK. I must say I could go without all the Yankee Stadium bashing, I was born into Yankee fandom, but I’m a bigger fan of baseball in general, and I can’t really argue with the points made. Caught you on TV when Marlon Byrd flied out to center. That is all I saw, as I was tired, and decided to sleep early, can’t say I am a Joe Morgan fan either, that is another story. Oh yeah, and like stlfan above said, you are featured on the mlblogs main page! That’s pretty cool. Sounds like you had a great Bday. Maybe next year we’ll be in the same stadium in the same two days? haha. Don’t you hate it when your mom gets busted selling meth? Mr. DUI had a bad day. What you need is some ‘green’ colored glove trick string. May not draw so much attention by the sec cameras…. Solid day Zack. About Carlos Quentin, I got him to sign a card when he was with El Paso in AA in 2004 with the D’Backs. I had 3 cards I believe and he was doing 1 per, which is quite rare for a AA guy. He wasn’t a jerk or anything, just seemed like he was going through the motions. 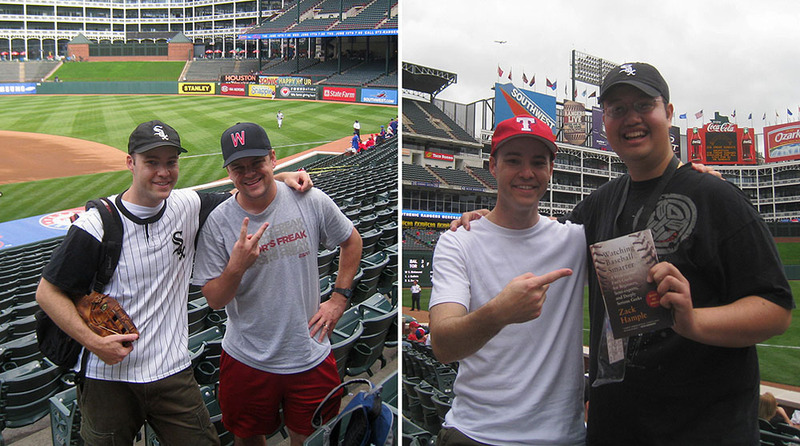 I live in Dallas actually and am glad you had a good experience at the Ballpark. Nice work on the lineup card by the way. May 6, 2009 - 6:16 pm thomasb. 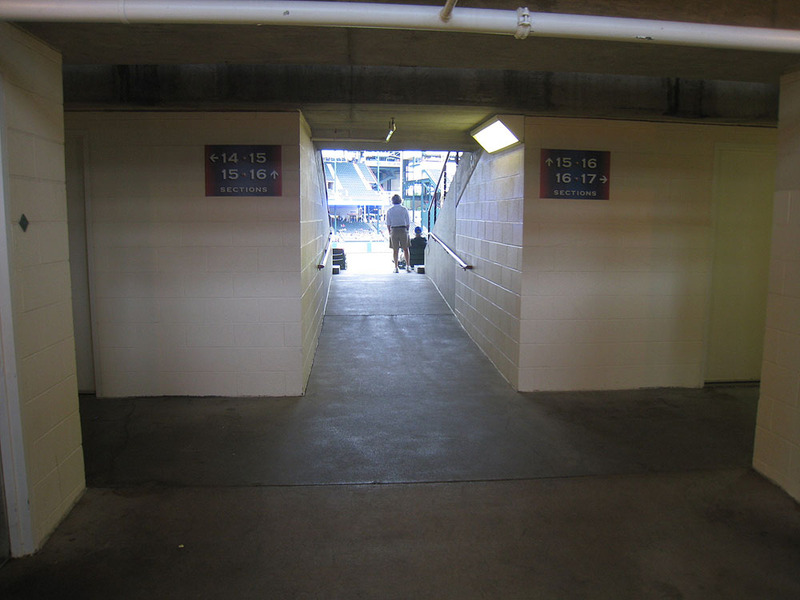 Zack, which entrance are you using tomorrow night at the Orioles game? I will be getting there early since I’ll be coming straight from school. I am planning a trip to see the Angels play and there are 3 teams that will be in Anaheim while I’m there. The Orioles, the Rangers, and the Yankees. I’d like to go see the Yankees, since I’ve never seen them in person, and LOATH them, but I’m afraid that it will be extra crowded (If Angel Stadium can get any more crowded … they sell out 80-90% if their games I think). Any suggestions now who I should go see from a ballhawking stand point? I want to guess that the two autographs you got on those ticket stubs are Hank Blalock (definitely) and Taylor Teagarden (just a guess). As for Quentin…I’m a Twins season ticket holder and went to all 9 games that the Sox played in Minneapolis last year. I tried, as did many others, to get his attention and hopefully his autograph…no such luck on either. He ignored everyone inside the dome each and every game he played there last year. Same thing at the team hotel. I finally got him to sign a card for me inside the team hotel before the final game of their final series in town during the last week of the season. And he really didn’t want to stop for me either but he felt compelled to as he saw me standing there talking with Griffey’s chauffeur and Bobby Jenks. And what a beautiful graph it was…NOT! “CQ”…what a jerk. Hey Zack…I doubt you remember me but I met you shagging balls during a game against Seattle in RF at Yankee Stadium on 9/5/07. Your Mom was with you and Ichiro was putting on a home run show like I’ve never seen before. Anyways I hope all is well. It looks like you’ve got life by the tail. Keep on blogging…I love reading your updates whenever I get a chance! Zack…Pete here again. You are not gonna believe this. Right after leaving the above comment I flipped on the Twins-Orioles game on Fox Sports Net North and THERE YOU WERE! It was right before play was to resume after the 2nd rain delay. I snapped a few still shots off my TV and will send them to you if I can figure out your email address. Word of caution: You might not like the pose the FSN cameraman caught you in during your 5 seconds of fame across the Upper Midwest. I kid you not…you were picking your nose! Unless it was a Jerry Seinfeld move…”it was scratch, not a pick”. Too funny! So if you want to see the “Zack Caught in the Act” photos from Camden Yards and you don’t get them shortly it means I don’t know where to forward them to. If that’s the case please send me an email tomorrow. I’ve only been to one game there, and that was nine years ago so I don’t remember much. All I can say is that the front row is highly overrated. It’s easy to get players’ attention from further back in the crowd, but that IS a stupid rule. Yes, I saw the MLBlogs page just a little while before you told me…but thanks. 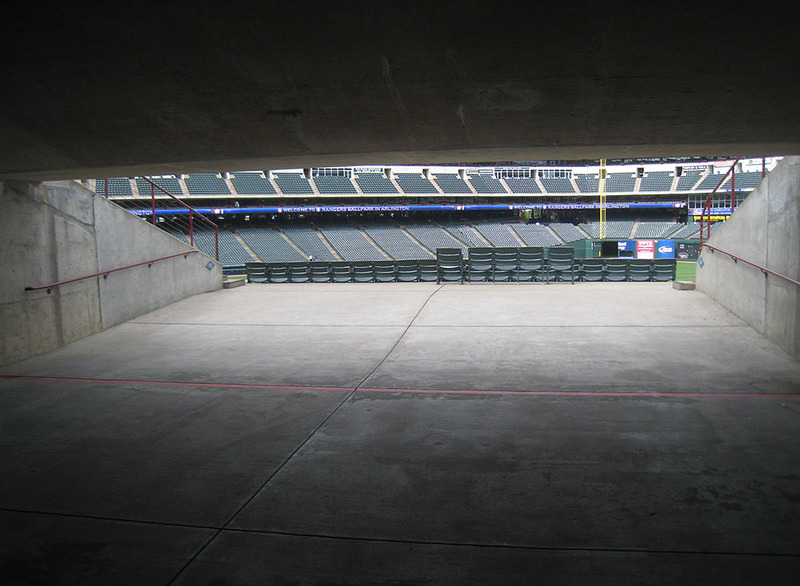 I’ll be at the center field end of the warehouse…near the ticket windows and the “numbers court.” You know…Eutah Street. I plan to get there around 4:30pm. Probably the Rangers. They hit bombs, and when they’re on the road, they’re good about tossing balls into the crowd. The second autograph is not Teagarden. Someone already guessed it…if you have time to scroll through the comments. As for the alleged nose-picking, I was actually biting my nails (which I do an awful lot). It’s a gross habit, but hey, it’s healthier than smoking. At least I wasn’t caught with my hand down my pants, right? Zack, what do you think of the Manny news? I know you are/were a fan of his. I’m also wondering what you think of those video game balls people are talking about. Will you count them? One thing you didn’t mention is when you look across the parking lot, you see the monster that is the new Dallas Cowboys stadium. The autographs are julio Borbon and Frank Francisco for future refrence. Manny is a putz. I’m done with him. As for the video game balls, I would’ve counted them if I’d snagged any. Ahh, yes. That place looks nuts. Ha, funny that you know that guy. Let him know that he’s famous.